LEARN MORE ABOUT THE Greenwich COMMUNITY! Money Magazine has ranked Greenwich number one on its list of the 100 best places to live in the United States and the Robb Report recently ranked Greenwich first among the top 10 towns in which to live in America. The affluent town of Greenwich has long been a haven for artists, entertainers, writers, athletes and major corporations. The 67.2-square-mile town, which has referred to itself as the Gateway to New England, is bordered to the south by the Sound, to the east by the city of Stamford, and to the west and north by Westchester County, New York. With a population of about 62,000, Greenwich offers an outstanding housing selection and numerous distinct neighborhoods, including Riverside, Old Greenwich and Cos Cob with their elegant waterfront properties. With more than 1,500 acres of parkland and 32 miles of shoreline, Greenwich offers a wealth of outdoor and recreational opportunities. Trails and paths are popular during summer months with bicyclists, runners and hikers. An active community sailing center creates a haven for boaters, and four beaches on Long Island Sound provide ample opportunity for enjoying the sun, sand and surf. Rich in culture, Greenwich is home to the Greenwich International Film Festival, a symphony orchestra, a choral society and the Bruce Museum. 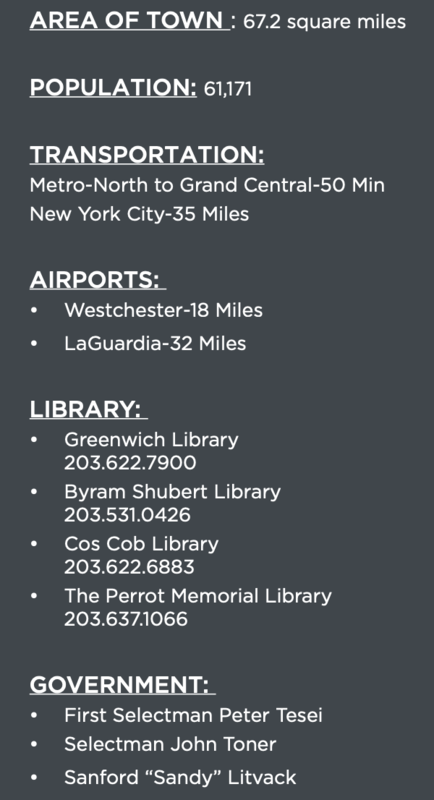 New York City is 30 miles away from Greenwich with 4 Metro North stations servicing the town. The closest airport, about 15 minutes away, is the Westchester County Airport, followed by LaGuardia and John F. Kennedy International Airport. Greenwich, the 10th town settled in Connecticut, was founded in 1640. It is sited along the shore of Long Island Sound and bordered by Stamford to the east, and New York to the west and north. Since its founding, when it was a 17th century woodland inhabited by Native Americans, Greenwich has been transformed through the centuries into an 18th century American Revolutionary War battleground, a 19th century New England farming community, a 20th century home to gracious landed estates, and a 21st century dynamic, multicultural suburb with the broadly diverse populations and neighborhoods of today.